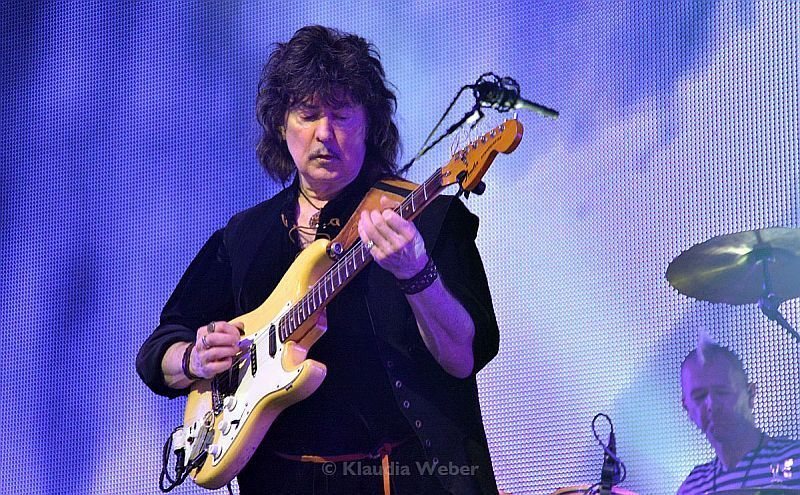 Nowadays you rarely get the chance to see Ritchie Blackmore playing rock music live. After his definite departure from Deep Purple in 1993, the disbanding of Rainbow in 1997 and the creation of the rock folk duo Blackmore's Night with his now wife Candice, the legendary English guitar player did not play any massive rock concerts until 2016. He had previously announced a long-anticipated Rainbow reunion, only for a few commemorative concerts, and there was a lot of speculation regarding the musicians that would be involved in the project. 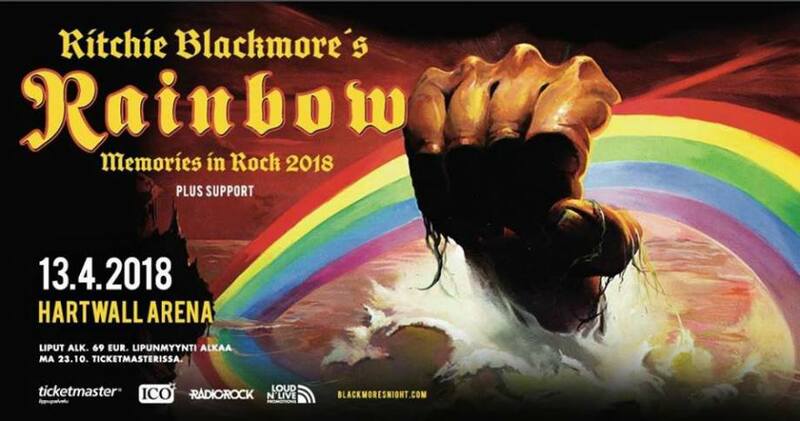 For some it was quite surprising that this new line-up, once again under the name "Ritchie Blackmore's Rainbow", would not include any of the former members of the band, except Blackmore himself. Maybe this was not so unexpected, since during Rainbow's history a massive amount of musicians have come and gone, Blackmore being the only permanent member of the band. This, to the extent that there aren't two Rainbow studio albums recorded by the exact same line-up. The guitar legend is infamous for his temper, his lack of patience and rapid mood swings. Maybe the biggest surprise in the new line-up was the inclusion of young Chilean-born singer Ronnie Romero, so far only known for his work in the Spanish metal band "Lords of Black". The rest of the band would consist of Stratovarius' keyboardist Jens Johansson, Blackmore's Night drummer David Keith and bassist Bob Nouveau. 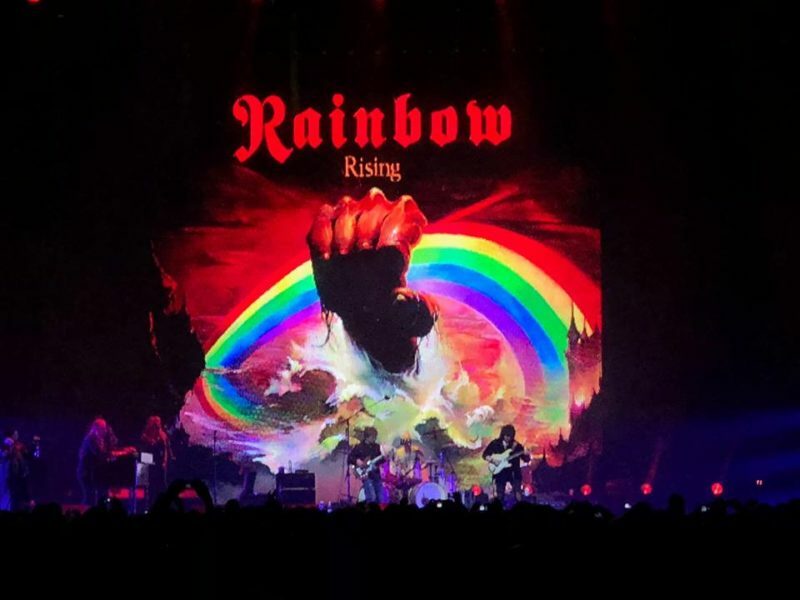 But the 2016 and 2017 concerts in Germany and the UK would make clear that the renewed version of Rainbow had the potential to perform a top notch rock'n'roll show. The releases of "Memories in Rock" I and II helped to prove their point, with Romero putting aside all possible questions about his ability to perform material from renowned singers such as Ian Gillan, David Coverdale, Ronnie James Dio, Graham Bonnet and Joe Lynn Turner. For the live performance he would get a little help from Candice Night and Lady Lynn in backing vocals. Blackmore seemed a bit slow and rusty in the first performances, but we shouldn't forget that the man is already over 70 years old. When in October 2017 they announced the new dates and locations for the five Rainbow gigs during 2018, I was gladly surprised that it included Helsinki, the city where I live now. A lot of expectation was built since the beginning among the Finnish fans, and also many people decided to come from all over Scandinavia and the rest of Europe. Tickets were sold out very quickly. We just had to wait until April, and the first two shows in Russia a few days ago gave us a bit of an idea of the show we were about to witness on Friday 13th at Harwall Arena. The Finnish band National Nightmare was the chosen one to open the night, performing a short set that concluded with Rolling Stones's "Gimme Shelter". But the wait had come to an end, and around 9 PM we could hear the introductory songs "Land of Hope and Glory" and "Over the Rainbow", and the musicians came onstage. A very powerful start with two tracks from the Difficult to Cure era: "Spotlight Kid" and "I Surrender". Blackmore was very serious-looking as usual, but his Stratocaster sounded loud and clear, and the rest of the band also seemed very inspired. Romero's voice was very impressive right from the beginning, giving his own personal touch to each one of the songs. The next one, "Mistreated", from Deep Purple's MK III, would release some tension with nice bass and guitar improvisations. 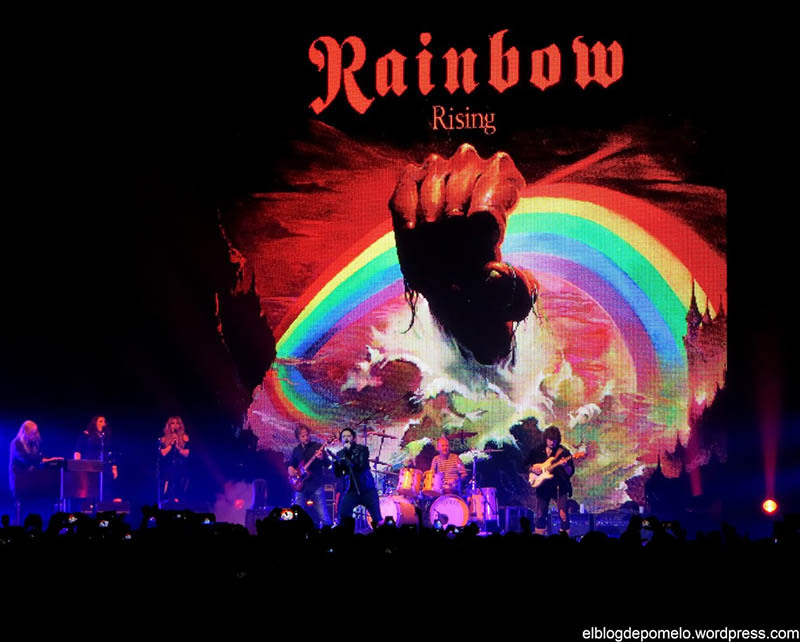 Back to the more commercial period of Rainbow, and with the art cover of Down to Earth behind the band, "Since You Been Gone" worked very well to wake up the audience once more, leading to the first of many references to the great Ronnie James Dio. "Man on the Silver Mountain", the first Rainbow single, was the perfect tribute to the best metal singer in history, who sadly left us eight years ago. From all of Rainbow's and Deep Purple's vocalists, Romero's voice mostly resembles Dio's. Then it would time for "Perfect Strangers", the biggest hit of Deep Purple's 80's reunion, a performance that gave us the first notions on Romero's ability to manage Ian Gillan's register without any problems. "Sixteenth Century Greensleeves" was the other reference to Rainbow's album debut, giving Jens Johannson the chance to shine on the keyboards. After that we witnessed one of the most emotional moments of the show, with the acoustic guitar performance of Stormbringer's classic "Soldier Of Fortune". The flexibility of Romero's vocal range kept surprising me, with a passion and sentiment that reminded of the best years of David Coverdale. They show continued with the instrumental "Difficult to Cure", a piece that I've always found way too corny. Bassist Bob Nouveau took the chance to talk to the audience and ask them to sing happy birthday to Ritchie, but the guitarist didn't seem too fond of the idea. From then on things got a bit weird. Despite Blackmore's evident bad mood, not smiling and not talking directly to the audience, the show went on with Graham Bonnet's era, the super hit "All Night Long". This helped to cheer up the spirits a little bit after such a tense and awkward moment over the stage. Then it was time for my favorite moment of the show, Romero speaking Spanish to the audience y saying hi to the "Chilean dude" in the arena. I assume that I am the "Chilean dude", since I sent him a message on Twitter during the week to let him know I was going to be there. The next song would be Romero's final test, since "Child in Time" is one of the toughest songs for any singer. He passed the test with flying colors. To begin the last part of the show, one of my all-time favorite songs, "Stargazer", started with an amazing drum intro, originally played by another hero that left this world way too early, I'm talking about the one and only, Cozy Powell. "Long Live Rock'n'Roll" made the audience go crazy and get very engaged in the singing of the chorus. After more than two hours of music, the concert would end in the weirdest possible way. They played Deep Purple's classic "Burn", but Blackmore was looking way too pissed off and irritated, almost sabotaging the end of the song. The band left the stage and the crowd kept applauding for minutes, waiting for an encore, since the previous shows were finished with "Black Night" and "Smoke on The Water". Nevertheless this wouldn't happen. The band never came back to the stage; there were no goodbyes or thank yous. The organizers of the event didn't help either, since there were no clear signs that the concert was over, the lights were still down and people didn't know what to do. After a few minutes some people started leaving the place, accepting the fact that they would go home without "Smoke on the Water". I waited till the end, but when the backstage crew came to take the instruments, the lights went on and the security guards started guiding the people outside the arena, it became clear that we wouldn't get an encore. At the moment of publishing this review, the reasons for the abrupt and surreal finale are still unknown, and maybe we'll never know the truth. After all, we're talking about Ritchie Blackmore, so anything is possible. Regardless of that, the concert was amazing and I had a great time. Happy birthday to the maestro, and Long Live Rock'n'Roll! A couple of years ago I went to see Ritchie Blackmore�s son J�rgen who was then in a tribute band with among others Joe Lynn Turner and some other old Rainbow members. The band was called Over The Rainbow. I always thought that I'll never experience anything closer to the real thing like that. Up until Ritchie Blackmore announced that he had formed a new Rainbow and they'd play a couple of shows. Well you never really know with these new formations, but then I saw who's in it and it caught my attention: Jens Johansson (Stratovarius) on keyboards, David Keith on drums (Blackmore's Night), Bob Nouveau on bass and Ronnie Romero (Lord of Black) as a vocalist. I waited for a couple of years, up until they finally announced they'd play at Hartwall Arena at Helsinki. Just my luck! I usually never do reviews without visuals, unless it's a gig I coincidentally attended. I was too late to get a photo pass unfortunately, but I decided to solve it this way. No photos means more crappy videos to somehow be able to grasp the atmosphere of the concert with me. First of all, again, I arrived a little late, so again, I missed the support act. But I was right on time for Rainbow, unfortunately like me, Rainbow was a little late as well. Anxiously I was waiting until it was time for them to begin. "Land of Hope and Glory" started playing and marked the beginning of an amazing night. Ritchie Blackmore came a bit early to the stage, which was surprising, as he wasn't really playing. Maybe he wanted to feel the audience's excitement? Because wow, the crowd really was. After two intros, "Spotlight Kid" kicked in with a lot of energy. We get acquainted with Ronnie Romero as a vocalist. First thing that comes to my mind is the resemblance to Paul Rodgers in his essence. Romero has an amazingly powerful voice, but he doesn't go around running along the stage. He doesn't have to. His voice is impressive enough, which reminds me a bit of Paul Rodgers, who has the same kind of glow over him. Romero seems like the appropriate choice to sing for the band, his voice can handle most of Rainbow's respective singers. After a very strong beginning, the audience was really excited and immediately got answered by their cheers in form of "I Surrender". The song was followed by Deep Purple�s "Mistreated", a song from "Burn". "Mistreated" is a very bluesy song. It kind of stood out for me in the setlist. Romero doesn't have that full-bodied voice that Coverdale has, but his voice sounds good in the lower registers as well and in general he can handle Coverdale very well. The band sounded really tight in the song, which is really important. From a mentally heavy song to something lighter again, "Since You Been Gone", one of Rainbow's classics from he 80s. Whole Hartwall Arena was going out of their minds, people were singing along, dancing along, jumping, whatever they deemed fit. The setlist is all over the place, it goes from the very beginning to the very end, and then somewhere in the middle, from vocalist to vocalist. I love every era of Rainbow and its history, but I definitely prefer the Ronnie James Dio time, those songs being more neoclassical, they sometimes just stand out. So when it was time for "Man on the Silver Mountain" I couldn't be more excited. And yes, what great rendition. After that it was time for some Deep Purple, "Perfect Strangers" started playing. This is where I somehow started comparing to Deep Purple, not a good plan. All in all, of course the sound was super tight and energetic, but it somehow felt like a light version of Deep Purple. I don't know where and how, but I felt like something was missing. This was only really the case in "Perfect Strangers", the rest of the Purple covers, were performed extremely well, often leading to magical moments. After "Perfect Strangers" it was time for some instrumentals and some joking around. Bassist Bob Nouveau was joking around, telling that no one was waiting for another bass solo. That's kind of you Bob. What however was quite impressive was Jens Johansson�s keyboard solo. Well, I play keyboards myself, I have an affinity for everything related to keyboards and I always love solos. Jens Johansson�s sounded very refreshing and well, let's be honest, is there anything that Jens can't play? The solo got followed up by "Soldier of Fortune", for me personally one of the highlights of the evening. Ronnie Romero especially shined here, he used a lot more clean vocals in here, which also suited him. After all that melancholy, it was time for "All Night Long", from the Graham Bonnet-period. A song the audience clearly had been looking forward to. Flawless. Then it was time for "Child In Time". It often breaks my heart that I was born too late to see Deep Purple play it live, I wasn't allowed to go to concerts when I was a kid, so I missed out on the experience. So yes, this is as close as it gets and it was a very impressive rendition. Romero reaches the most difficult parts of the song with ease and it sounded close to perfect. "Stargazer" was the next in line, which was something I had been looking out for. 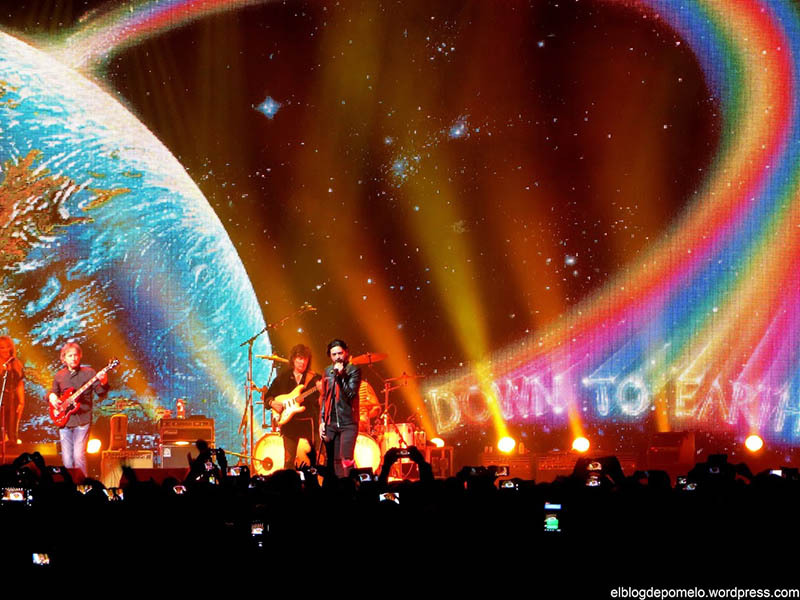 The song has been my personal Rainbow favorite and I was really happy and excited that they played it. Together with "Soldier of Fortune", this was just the best moment of the whole show. It felt like the whole show basically was leading up to this moment. "Stargazer" started off with drummer David Keith showing some of his licks and kicked in with power. Romero is no Ronnie James Dio, but comes quite close. In fact during "Stargazer" there were moments that if I would have closed my eyes, I would have been sent back straight to seventies. 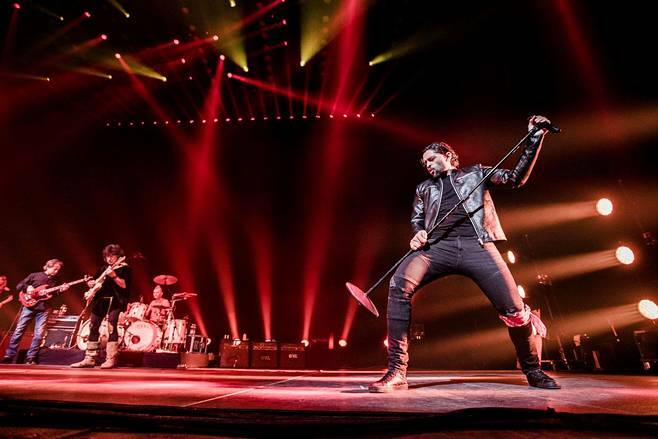 After that it was time to get the crowd active again with "Long Live Rock �n' Roll". Which started off with the audience clapping and shouting very loudly. Quite impressive, if you know that Finns usually are more of a quiet audience. They were having the best time. The atmosphere was clearly top-notch. The band tore down Hartwall Arena with "Burn", another Deep Purple classic. Unfortunately the crowd was left with a hunger. It seemed like no one could ease the crowd. For at least 10 minutes after the show, the audience still was there hoping for their heroes to return. But no such thing happened, which was a little bit unfortunate. Well, 13 songs is quite a bit, but at least they could have come back and waved a little bit at their fans, but well who knows, maybe they were on a tight schedule! Even though a bit of a unhappy ending, the band definitely was worth the while to go see. The new Rainbow has as much of a top tier level than the older versions of it. The band involves great musicians and in addition their new song sounded really amazing. Hopefully this generation of Rainbow will stick around and do even more shows. I'd definitely go back to see them over and over again. In the dusk the concert hall includes a rhythmic clap. Ritchie Blackmore's Rainbow has played for two hours, but are still waiting for the encore. The desire to hear some of the Rainbow or Deep Purple songs does not relax with the most intense fans, but slowly the people are starting to drift out of the auditoriums out of the way by the other viewers. At last the lights light up and faithfully the people waiting for the minute trade will realize that Rainbow no longer returns to the stage. Listen to the booing. Drummer David Keith, sitting next to the platform, does not seem to know for himself whether the band would play or not. The ending was peculiar, but on the other hand it was brilliant for the nightmare of the well-known Blackmore 73rd birthday. The guitarist has most often followed his own instincts without compromise, which is why even during the evening band has annihilated dozens of musicians during its history. Although Rainbow (as well as Deep Purple, whose production dominated the setlist of the evening equally), has seen luminous callers in the ranks, a certain mercenary spirit belongs to Blackmore. So it did not really hinder that, for example, Ronnie Romero, 36, we had not heard much of him before Rainbow. It is essential that he is able to adapt relatively broadly to the styles of Joe Lynn Turner and Ronnie James Dio as Ian Gillan and David Coverdale. The Deep Purple classic Child In Timo Romero played in a way that today's Purple would no longer be able to. The epic pearl was perhaps the best song on the evening. Although the booing was ultimately the ultimate one, the band had previously offered a fairly worthy dose of heavy rock from the history in the 1970s and 1980s. Some places were very strong, on the other hand, for example, Perfect Strangers sounded distressed. It is not possible to call the evening show in the show, but the band felt as though they were at a time to come to terms with what their leader decides to want. Thus, Romero spied in Spanish as Blackmore commanded. During Burn, the guitarist slowed down the tempo of his playing just to keep others awake - in order to show who ids the leader. He did not come to collect his birthday present. All this may sound negative, but overall there was a positive ripple. Blackmore's gigs are, in spite of the hit tube, familiar and safe. Maestro feels the unpredictability of repeatedly applying for a moment alchemy, which in the 1970s was reflected in a half-hour sooloing and guitars to destroy, now he is a little more subdued. The audience may never have a complete idea of what it takes to watch Blackmore gigs. Blackmore does not even have the impression or interest in what kind of expectations he can get for his gig. That's Ritchie Blackmore. A roar of horror, but a masterful musician. Ritchie Blackmore is undeniably the most important doctrine of hard and heavy rock, but also a legendary tricky person. The age-old roulette with Deep Purple's Ian Gillan is looking for him, and in the decades many other bandmates have gained their share of the maestro's sake. Perhaps the most frustrating thing was Rainbow's treatment of Graham Bonnet in the 1970s and 1980s: Recently, in a television documentary in Finland, Blackmore made it clear that Bonnet's kicks were influenced by this hair style, which did not please the band's boss. 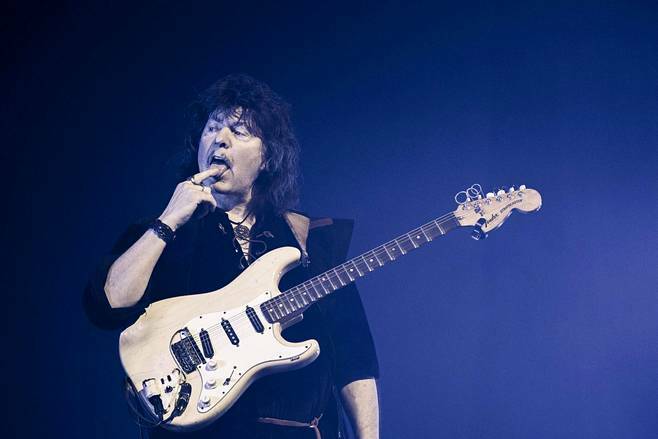 The devastating flair of guitar virtuoso gave rise to embarrassing moments in the sold-out Hartwall arena, where Blackmore arrived with Ritchie Blackmore's Rainbow. This time, however, it was not necessary to witness the same drama as Deep Purple's Helsinki Concert in November 1993, when Blackmore got off the stage in the middle of the song, took the same end of the band the same evening and did not perform any longer with Purple. There were some sort of things with the big one in the air today. Now it was a nostalgic Rainbow concert, though the only Rainbow man on the stage was Blackmore himself. The best known name of the backing band was definitely the Swedish keyboardplayer Jens Johansson. His CVs were also quite promising for this composition: The experience of the Rainbow songs is, among other things, Ronnie James Dio with DIO in the 1980s and early 1990s. Johansson has also been known for years on the road and in the studio with great personalities such as Yngwie Malmsteen and Timo Tolk. Johansson's performances were the most impressive of the evening. They fit both unconventional Hammond rock, duelings with Blackmore and bass player Bob Nouveau, and improvised solo when at a traditional organ, when Stratovarius cracked. The biggest applause was collected for Finlandia, which was played during solo. The biggest question mark before the concert was the singer Ronnie Romero, a 36-year-old Chilean, most of whom had hardly heard before. Romero, who was captured from the Spanish Lords of Black, was fortunate, from the beginning, the most outstanding Rainbow vocalist. Romero's voice was surprisingly painless enough to interpret the voices of Purple vocalists Ian Gillan and David Coverdale as Rainbow's singers Ronnie James Dio, Graham Bonnet and Joe Lynn Turner. His own spice interpretations were supported by female background singers, including Ritchie Blackmore's wife, Blackmore's Night's singer Candice Night, was responsible for their fervor. Romero was also entrusted with the bulk of the audience's singing and screaming. He tried hard, but for some reason the audience was surprisingly bad, which the singer also noticed. You would think that Friday night and a real nostalgia plumage would make you want to live in a stubborn dungeon, but this time, the handsome pocket in the pockets would be able to get over the neck. Of course, the more progressive songs, such as Mistreated, Child in Time and Stargazer, and the acoustic Soldier of Fortune, were a great success for the audience. Many, including the signatories, expected the show to be the fastest slices like the Spotlight Kid, Long Live Rock 'n' Roll and Burn. However, they turned out to be disappointing because the interpretations had a nasty drainage, and not the rhinestone cloak of the Blackmore fingers was the most difficult. There were some embarrassing mistakes in some of the songs, and Blackmore left some points even without calling. Even in the early part of the gig, Maestro seemed surprisingly good-humored and, among other things, blazed and bowed to the audience. By midnight, Blackmore had then become nervous about the screams on the stage or the rather lazy mood of the arena. This could have contributed to the rather embarrassing episode that was experienced during the Beethoven part during the Difficult Curse. At some point, long bias bassist Bob Nouveau announced that now it would be time for a bass solo, but you do not want to hear it (totally true, by the way). Instead, he spontaneously began to call Happy Birthday to You and digged a package to Blackmore in honor of the birthday of the guitar hero the following day. The Nouveau gift, judging from the package, was apparently a miniature guitar that Blackmore should have burnt or lit in fire as in the good old days. 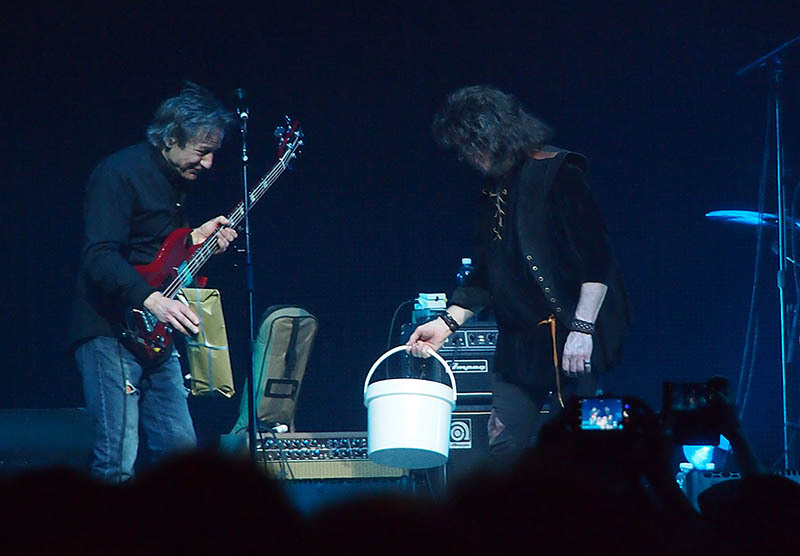 Despite the strong persuasion, Blackmore, who had already got a bucket (perhaps a firefighter), did not agree to take the gift but left the stage. 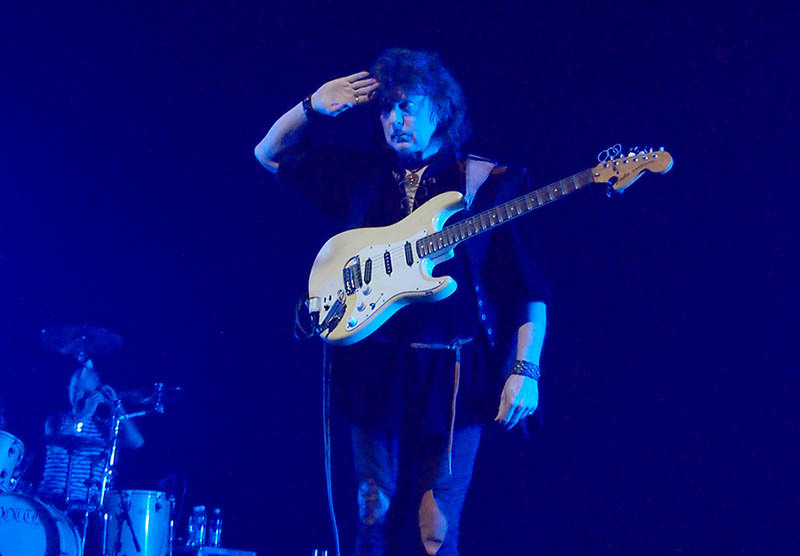 The merry Nouveau tried to lighten the mood by joking that this might be his last gig in this lineup, as Blackmore's indignation is not known to be good. The strange episode ended when Nouveau got the choreographed Jens Johansson's organ solo, which was quite stylish. Then Blackmore returned to the stage and finished the gig. When the concert had been going on less than just two hours, Ritchie Blackmore's Rainbow left the stage after Burn, with the slightest rumors that the audience was allowed to wait for the show to continue. Of course, the crowd began to shout Rainbow's name, but nothing seemed to happen. At this point, I thought that for once the encores are not coming automatically but the public really needs to work for them. Also the band's drummer David Keith is on the side of the canopy, as if he is still here. When the applause and screams had continued for a few minutes and a significant part of the crowd was already leaving the hall, it was ultimately to be credited that no further increases are yet to come. Some of the band ended up betting, as in the last two gigs they had two encore, Black Night and Smoke on the Water. Although the show ended as if in the middle, it was, after all, a good solution. Of course, ten minutes of the band's back-to-back part of the gang, which had cleared nearly three-digit sums of tickets, would have offered an extra time. But when the main fan of the show was most obviously typing, hardly any encore would have any more than life's experiences disconnected. As you can still see that Blackmore's craving was at least partially a moody act of the public, Helsinki could not even have earned any extra delays this time. "Not the years spent, they consume", is the old wisdom sung by Pauli Hanhiniemi. This third woman's text could have been in the eyes of more viewers when the audience followed Ritchie Blackmore's play in the Hartwall Arena. Blackmore is a multi-generation guitar junkie that has been played on his 73rd birthday Friday, and the effect is right in all the heavy rock news on Earth. The Hartwall Arena was smoothly filled with guitarist disciples who grew up listening to Deep Purple and Rainbow. Could it be that the viewer, who was inspired by many Blackmore tracks on the Stratocaster, would have been able to show the old hits more precisely than the star himself. Ritchie Blackmore is now a brittle old man whose ringing sounds fuzzy and insecure. Blackmore's new Rainbow set-up featured a long line of classics in Helsinki: Stargazer, I Surrender, Burn, Since You Been Gone, Child in Time and Long Live Rock'n'Roll are songs that have become part of the rock music DNA. Key players Jens Johansson, singer Ronnie Romero, bassist Bob Nouveau, drummer David Keith and two backing vocals played their part well - especially Romero's voice was awesome. The sound of the Chilean gold ring is good for both Ronnie James Dio and Ian Gillan. Johansson was also a great choice for Jon Lord's boots. The band also required professional skills so that the callers had to keep track of whether Blackmore would stay with others. At times it felt like the guitarist would not have quite remembered how his own song went. Some of the tracks Blackmore simply did not play, and for example, in Burn's crunchy guitar riff, the rhythm faded worse. From time to time, Blackmore stepped in and the band wound up to become a tight unit. The slower Deep Purple hits, Mistreated and Child in Time, became the highlight of the concert - especially the latter classic grew up to grow into cold, hilarious anthems. The acoustically presented Soldier of Fortune also impressed. 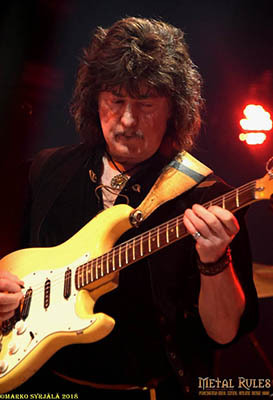 Blackmore has favored the recent decades mostly of acoustic guitar, and thes vocals went through more than one song in this program number. On the other hand, I Surrender and Since You Been Gone, the moving piece of material was, at its worst, not inspiring. Blackmore's guitar was mixed up as the ultimate instrument, so every one of the cracks was dumbfounded. Perhaps Maestro himself noticed that the thing did not work, as Blackmore most affected the gig of bad luck. Bob Nouveau tried to excite some of his birthday bounty on his band leader, but the guitarist left the stage and left the bassist joking about each other. At the end of the show, the crowd froze when the band did not come to show encore. Otherwise, it was the case with previous gigs in St. Petersburg and Moscow, where the band finally played Black Night and Smoke on the Water. With the Helsinki gig, it's easy to understand why Deep Purple does not heat up for Blackmore's proposal to the old line-up reunion. Purple works better with Steve Morse than with their old guitarist. By the way, the evening warmed the heart that great music was in its wake. It was certainly important for many viewers to hear the classics once again by Blackmore, and when some program numbers still grew to be interpretive, what better is it. But if Blackmore were to continue with the Rainbow and bring their group back to Finland, Hartwall Arena would be considerably more empty than ever. Ritchie Blackmore's Rainbow!!! That should be enough to rush to the nearest ticket dealer � and thousands of Finns shared my opinion because Hartwall Arena had been sold out for a while until they decided to open another slightly-restricted-view section just to fulfil the demand. Or you could browse social media for ticket offers for decent prices. All those fans from all over Finland and even neighbouring countries and the therefore, errr, difficult traffic situation might explain why the arena did not look sold-out when support National Nightmare entered the stage punctually. Admittedly I had never heard of this band before although featuring Finnish legends: Jimi Sero, bassplayer from the legendary Smack, guitarist AceMark, known from Californian classic rockers Bigelf, lead singer Sami Haxx, formerly of the Species, and drummer Teddy T. Rexx, also known from Dingo among others, plus G��g� (e.g. Wankers of The Zoo Crew) as live-percussionist. Their Blues-based rough Rock'n'Roll/Hardrock appealed to quite a lot of people. During the changeover I had time for observations: There were fans "since the band's early days" and very young people; e.g. a dad and his teenage son wearing Rainbow shirts in the front row � who was the die-hard-fan, who the "Plus-One", or were both equally thrilled? A gothic girlie right besides a gathering of "grey panthers" � hey, that one looks like Matti Nyk�nen? Later, near the mixing island, a group of mid-20ss, all enthusiastically clapping and singing along � Rainbow is indeed a band that unites generations of fans. Generations are bridged on stage too, which became obvious when with a 10min delay Ritchie Blackmore and his Rainbow crew entered: Over here the legendary Rock veteran Ritchie Blackmore and colleagues close to his generation (Bob Nouveau on Bass, Jens Johanssen on Keyboard), over there the youngsters Ronnie Romero (Vocals) and David Keith (Drums), plus the Backvocal-Duo Candice Night (Ritchie's wife) and Lady Lynn � who had grown up with the music of this already famous guitar wizard. What else needs to be mentioned was the casual unspectacular look and attitude of the whole band. No fancy costumes / pyro overkill. The fantastic show effect was provided by a huge digi-wall where e.g. Rainbow record cover motives were projected, and of course the lighting. Naturally the band mastermind drew most of the attention. Ritchie proved once again his particular talent for detail and nuances in his guitar performance, rather as underlining interludes than lengthy solo parts. Other band members had their short soli to shine � Jens honoured the Finnish audience with a "Finlandia" rendering before returning to Beethoven, Difficult to Cure and a � luckily only virtual � blast of fire works. 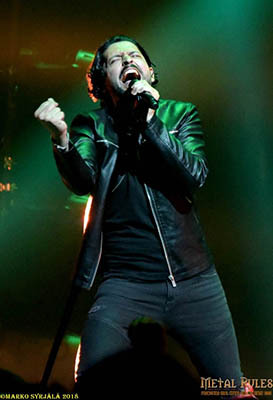 Yet this agile and vocally flawless front man Ronnie captured the attention too � he ran across the stage, smiled, chatted with the audience and inspired everyone with his passion and charm. He mastered heavy stuff like Man on the Silver Mountain (interwoven with Woman from Tokyo), Pop-style hits like I Surrender or soft acoustic arrangements � e.g. of Soldier of Fortune � equally well. Chapeau. Well and then � they just left the stage, no statements nothing, therefore everyone assumed they will be back for encores... and then there was almost 15min of cheering and shouting � and then the lights went on. What happened? Was it because of Bassist Bob's "Solo" � rather a Stand-up Comedy then serenading Ritchie's 73rd birthday and presenting a present � which was not accepted, Ritchie even left the stage � did he put both feet into it, does he even still have a job? Mr. Blackmore is not quite the person you would associate with a cheerfully silly sense of humour. Or was it for strict local curfew reasons, like "no more noise after 23h" � and it was 10 past already when they had stopped playing? Unfortunately several fans were so upset about this unusually casual wrap-up of a concert they started booing � which I found totally uncool. Hey, sure, I would have liked to hear encores too (e.g. Black Night and Smoke on the Water, what they did in Moscow), and I would have loved to have Temple of the King on the Setlist. Still no reason to shout BOOOO at a band that just gave you a fantastic, stunning 2-hour gig � and that spoiling of a good-evening-out is the only thing for me to complain about. Ritchie Blackmore is an institution and a pillar for the genre of heavy metal and rock in every possible way. His works with Deep Purple and Rainbow have been carved into the history of heavy metal. Those years spent with Ronnie James Dio were pure magic and all the three albums, "Ritchie Blackmore's Rainbow", "Rising" and "Long Live Rock'n'Roll", are still considered as a milestone of fantasy and epic metal outputs. Whereas the era with Graham Bonnet and Joey Lynn Turner, paved the way for Rainbow to venture more into the radio-friendly mainstream rock. At that period the band achieved its biggest hits with "I Surrender" and "Since You Been Gone." Frankly, Richie Blackmore is definitely one of the most respected and valued guitarists, and his work in the hard rock genre as well as in the Renaissance music is adored and worshiped by millions of rock fans around the globe. As a matter of fact, there are only very few guitarists who are able to do sold-out tours by playing in magnificent big venues, Ritchie Blackmore is definitely one of them for sure. 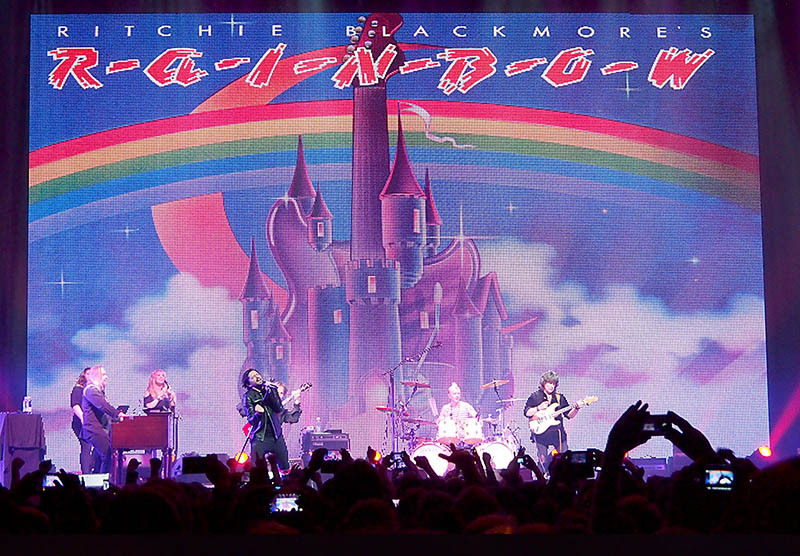 Blackmore's Rainbow usually does only a few selected shows in a year, therefore seeing them or him performing the classic tunes is quite a cultural experience for fans. 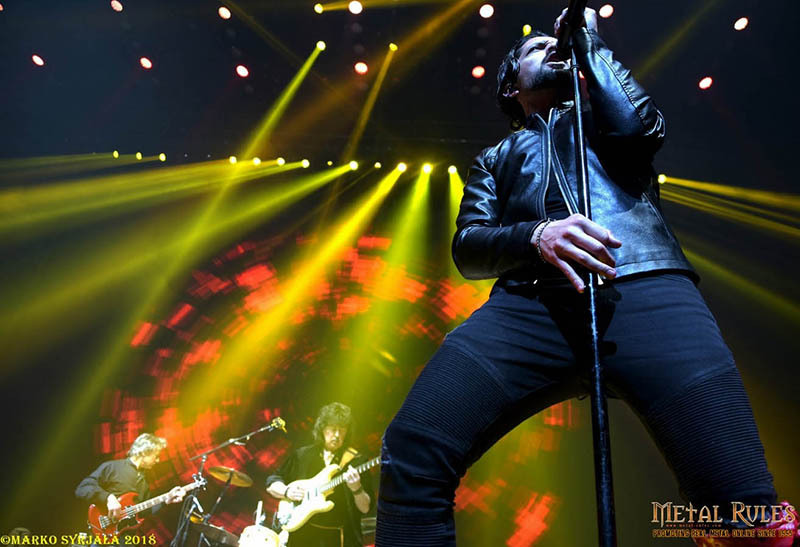 The show at the Hartwall Arena was 100% sold out when hard rock and metal fans, between the ages of 20 and 70, arrived to see and listen to the old jewels of the classic Rainbow and Deep Purple songs. The crowd must have figured out this could be the last chance to hear Ritchie Blackmore playing those songs anymore. The two-hour set got its prestigious start when Blackmore arrived at the stage and brought out the recognizable riff of "Spotlight Kid." As far as the setlist is concerned, there is always something to say and squeak for and against of it. Of course, when entering into a concert of a band like Rainbow, the expectation to hear some certain songs is more than obvious. When looking retrospectively at Blackmore's history, Deep Purple definitely plays a major part in his era and history. All in all five songs of total fourteen were included from that era, whereas nine had been picked from Rainbow. Rainbow has occasionally also played a couple of songs of Blackmore's Night, but they had been skipped in Helsinki. As for the Deep Purple cuts, "Soldier Of Fortune" with the acoustic version definitely sounded splendid as Ronnie Romero's interpretation was beyond the expectations as his voice outstandingly crowned that song. Jens Johansson's solo part was pretty surprising as he dedicated the Finlandia hymn to the Finnish show and finally, the whole outfit ended playing "Difficult to Cure," which is Rainbow's own version of "Beethoven 9". As a whole the set was quite as expected with no surprises. However, one nice song can be picked up, and that was "Sixteenth Century Greensleeves." The song has also been played in few other shows, but quite rarely. Other highlights were Purple classic "Child in Time," where Ronnie Romero was able to shine and "Stargazer" which is so grandiloquent and epic, that can't be ignored from the set at all. "Burn" from the David Coverdale era of Deep Purple concluded the two-hour rock journey to Blackmore's hard rock days. The backup band turned out to be vigilant thru the whole show when Blackmore's way of picking up songs and communicating with the band was peculiar. The Stratovarius keyboard wizard Jens Johansson didn't have that much room to hassle and joke as he does at shows of his main band. Instead, he and other colleagues had to keep the eyes and ears open in order to be able to follow Blackmore's playing. As far as Ritchie Blackmore's playing is concerned, it was fumbling and he skipped a lot of guitar parts quite entirely. The band definitely kept the whole package together thru the entire show. Ronnie Romero knows his place in the band and on the stage. His way of singing the old gems did and created the justified feeling. It ain't any unpleasant to compare Romero's voice to Dio's voice. The drummer David Keith is definitely skilled pro drummer, even though his habitus definitely made the eyeball roll of some fans. Apparently, Blackmore wasn't pleased with the playing as he communicated with the band members several times and gave his signs and notifications through the show. The maestro himself definitely guided the band as the leader is supposed to do. The bassist's Bob Nouveau desperate birthday wishes for Blackmore shared a sense of shame feeling as Blackmore couldn't care less about it. Candice Night took care of the background vocals along with her co-singer. Her role in Rainbow a little different whereas she is the crucial part of Blackmore's Night but she seemed to have a great time on stage. The way how the concert ended up was a total bummer. The band just left the stage, as usual, the crowd expects to see they coming back and playing a few encores. Rainbow had played a couple of the Deep Purple songs as an encore on earlier Russian dates, but no not this time. Therefore missing the encore, "Black Night" and "Smoke on the Water" wasn't that major blow. However, the crowd was definitely genuinely disappointed about that. But obviously, the rest of the band were quite baffled while wondering about returning to the stage or not. Instead, Blackmore is known for being kind of moody personality. When lights went on, the crowd's reaction was puzzled and truly gutted, when booing and whistling. The band didn't offer and perform any gimmicks at the stage as the look of the construction of the stage was truly simple and reduced. It had to be pointed out and resembled the people had arrived to enjoy the show and songs; they definitely got them. It was definitely crucial for the 12.000 crowd to hear these old classics. The whole two-hour show was a pure nostalgia trip to celebrate the grand hymns of Rainbow and Deep Purple. This could be Blackmore's last hooray to perform these songs from the past in front of thousands of people because of the time is passing by. Judging by the performance and historical aspect of Rainbow, this could be the most polite and sophisticated way to lay the legendary rock band on the rest permanently.